Have a PC or a laptop? You download a document or transfer a photo to your system, and where do you first place it? "Ah for now, let me put it on my desktop, I'll move it later!" And it remains on the desktop till the number of icons on the desktop makes you go crazy! Then you make a folder 'Desktop files' or if you are like me - 'Others'. And then comes a crucial time when you need 'that very file' and "Oh God! Where did it go? 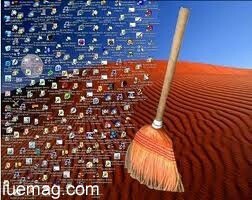 I have 5-6 folders by name Desktop Files!" I'm sure you can empathize with the above situation. So what do you do? For Chrome - Chrome Menu -> 'Options' -> 'Under the hood' -> 'Downloads' -> 'Ask where to save each file before downloading' and so on for other browsers. Now when it asks you each time you download, kindly do not choose desktop, create a folder if need be and dump it there. A stich in time saves nine remember? Files transferred from a pen drive or external hard disk - General tendency yet again is to put it on the desktop. Be cautious. Choose a relevant folder or create one. You'll love yourself for it another day! Word documents, Spreadsheets, Presentations or any newly created file - Here, apart from choosing the right folder, it's equally important to name the file correctly instead of naming it 'New', 'Sample' or leave it 'Untitled'. Photos and videos - C drive, D drive, E and F also may be, will contain at least one photo, or worse even, contain a folder 'Photos' each. Best way to solve this is to keep each drive for a different purpose. One entirely for college/office or anything related to college/office (Yes, even if they are your photos with college-mates) Another folder - completely personal - which has nothing to do with college or office. This should do, for a start. One tip to conclude - The best way to compel yourself to keep your desktop clean is to put a desktop wallpaper (Stretch) so beautiful that you wouldn't like to dirty it with icons and icons all over. I suggest a photo of someone you admire. Could be yourself as well! So here's me, wishing you luck!